Documents: Meeting Minutes, Agendas, etc. Please note that this page is only for candidates applying directly to the SVANC for vacated seats that are filled by board APPOINTMENT. For citywide ELECTION information and filing forms, click Election/Voting on the left side menu. Thank you for considering being a part of the Sun Valley Area Neighborhood Council! The Candidate Filing Form must be received by the SVANC by the LAST Tuesday of the month before the next month's second-Tuesday board meeting where the application will be considered (Example: For an approved application to be voted on in the February monthly meeting, it must be received by the last Tuesday in January). Complete applications received after the deadline will be considered for the open seat of the same category in the following month if the vacancy is not filled. Please note: In 2017, the City Council extended current Neighborhood Council terms by one year to prevent overlap with citywide general elections in even years. 4 year terms ending in 2018 were extended to 2019, and 4 year terms ending in 2020 were extended to 2021. Information is included for all board seat categories though not all may be open / available at any given time. Resident (7 seats): Stakeholder who is 18 years of age or older whose primary residence is within the SVANC boundaries. Business/Property Owner (7 seats): Stakeholder who is 18 years of age or older who owns property (other than their primary residence) within the SVANC boundaries, owns or operates a business whose regular base of operation is within the SVANC boundaries, or works within the SVANC boundaries. Senior Representative (2 seats): Stakeholder who is 55 years of age or older (at time of seating) who lives, works, or owns property within the SVANC boundaries. These seats are filled only by board appointment. Youth Representative (2 seats): Stakeholder who is 14-21 years of age (at time of seating) who lives, works, owns property or attends school within the SVANC boundaries. These seats are filled only by board appointment. 1) Review the qualifications to make sure you qualify for the seat for which you wish to apply. 2) Download, print, and fill out the Candidate Filing Form. The 150 word candidate statement is optional but helpful, and can be read to the board and attending public at the meeting before the vote on the seat is to take place. 3) Review the Acceptable Forms of Documentation document (PDF) in the section appropriate to the seat for which you are filing. See Documentation Notes Below. NOTE- Senior and Youth candidates must provide proof required in two sections of the document: A) the section applicable to the type of Sun Valley Stakeholder you are (Residential or Business/Property Owner/Student); and B) the Senior or Youth section as applicable,. See Documentation Examples below. Special note for Senior Rep and Youth Rep (annual term) board members: If you are refiling in the same category, you do not need to resubmit identification documentation that was submitted with a previous application if that documentation is current and nothing has changed. 4) Return this information as noted on the bottom of the form (scan and email, fax, or mail). Email is recommended. 5) Make sure the form is RECEIVED BY US by the LAST Tuesday of the month so it can be placed next month's meeting agenda if complete and approved. Please submit your application early, and make sure it's complete, properly signed and dated, with all required documentation included. Last minute applications may not allow for time to correct deficiencies before the deadline. 6) VERY IMPORTANT: Be eligible to vote right away if you're appointed! To be a board member, per California law, you must take Ethics training. It's good for two years. And to be eligible to vote on funding (finance) items, you must take Funding Training. Lastly, you have up to 30 days after your appointment to sign the Code of Conduct policy, but it's good to get it done and it's fast to do. For Ethics & Funding training, and the Code of Conduct policy, select "Board Member Reference" from the left menu (near the bottom) and read through the relevant sections. You can do these things in advance - you don't have to be on the board yet to start the process, and you don't need to do them again (if they have not expired) if you apply for a future opening. 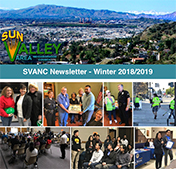 7) If you have any questions, please contact us by email info@svanc.com or call 818-767-8262 (if no answer, please leave a voicemail since, as volunteers active in the community, our office hours vary). You may redact (cover up or black out) the ID, Driver’s License, or passport number on your document, or social security number on your Medicare card, etc., before sending it to us. If you are a Senior living in Sun Valley, and you are applying for the Senior Representative seat, you would include documentation to prove your identity and your Senior status, then documentation confirming your Sun Valley residence address. Note that these documents can be a single document if it covers all required aspects of the filing status (such as a California ID or Driver’s License that shows the birthdate 55 or more years ago, and a Sun Valley residence address). Consult the Acceptable Forms of Documentation document for acceptable types and combinations of documentation. If you are a 16 year old Youth who lives in Pacoima and goes to school in Sun Valley, and you are applying for the Youth representative seat, you would include documentation to prove your identity and your Youth status (between 14 and 21 years of age at time of seating), and your student status (due to applying based upon attending a Sun Valley school), usually using a confirmed school ID. Consult the Acceptable Forms of Documentation for acceptable types and combinations of documentation. Hello and Welcome To The Sun Valley Area Neighborhood Council (SVANC). We on the Election Committee would like to talk to you about running for office in the SVANC! The SVANC is a local neighborhood branch of City government. Though the SVANC does not have the ability to mandate any action, we are advisory to the Los Angeles City Council and other City entities such as the Zoning and Planning departments. 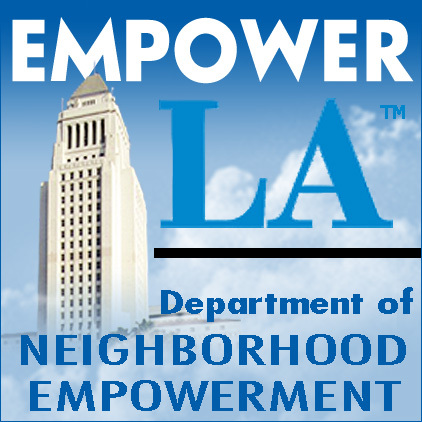 For instance, the LADWP (Department of Water and Power) is supposed to consult with the neighborhood councils before they take action on items such as rate hikes. The City funds each neighborhood council equally each year. For fiscal year 2015-2016, the SVANC will receive $42,000 to be spent in our neighborhoods for elections (the city does not subsidize neighborhood council elections), and most importantly for community outreach, improvements and keeping our stakeholders informed, along with some administrative overhead. Members of SVANC are elected from four categories; Business people in the community, Residents of the community, At-Large and Community Interest Stakeholders who may be members of local community organizations, local Faith Based organizations, or people who declare a stake in our neighborhood and affirm the factual basis for it. The term of office is four years. We also have two Senior Representative seats (age 55+) and two Youth Representative seats (age 14-21) that are filled by board appointment yearly. There is no remuneration. This is strictly a volunteer position. But this is a wonderful learning experience! You will gain knowledge and insight into the inner workings of the City government, and find out things at our meetings that are not often publicized in the media. Plus you will have closer access to your city leadership to enable you to make a real difference in your neighborhood. Our board members meet with the public once a month (every second Tuesday) at Villa Scalabrini Retirement Center, 10631 Vinedale Street, in Sun Valley (see our home page at svanc.com for directions and a map). Our meetings last about two hours, and are attended by various local, county, state, and federal officials, and public safety officers. In addition, there are Committees that look into Outreach, Community Affairs, Planning and Zoning, Beautification, Emergency Preparedness, etc., issues. These committees generally meet once a month for about an hour, and membership is open to all stakeholders as defined in our Bylaws. Some boardmembers also attend meetings of the City Council, the School Board, Housing Board, and various LA City Council Committee meetings. YOU can make a difference. You can help improve the quality of life for your neighbors.